Among functioning neuroendocrine tumors (NET, formerly called islet cell tumors) of the pancreas, insulinoma is the most common tumor, followed by gastrinoma, glucagonoma, VIPoma and other secretory neoplasms, which are more rarely encountered. In functioning pancreatic adenomas, the clinical diagnosis is based on clinical data and laboratory tests that usually permit an accurate diagnosis. Cross-sectional imaging is used only for localizing the pancreatic neoplasm. NETs represent a challenge to the radiologist. Extra-pancreatic NETs that are small and located in the duodenal or gastric wall are the least likely to be detected pre-operatively by any of the radiographic techniques, and even intraoperative ultrasonography fails to detect these lesions. 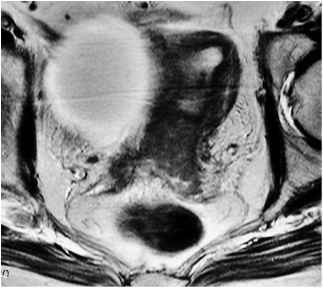 These ectopic lesions are more likely to occur in patients with multiple endocrine adenomatosis (MEA) or multiple endocrine neoplasia (MEN). For insulinomas, angiography is reported to reach sensitivities between 59 and 80%, while venous sampling reaches sensitivities between 77 and 94%, with results slightly better for gastrinomas . A combination of intraoperative palpation and intraoperative ultrasonography was found to achieve best results during surgery. Intraoperative ultrasound is particularly important in patients with multiple lesions and MEN, as under these conditions, ectopic tumors are quite frequent and often difficult to find with CT or MRI. On CT and MRI, functioning NETs show intense enhancement in the arterial phase with rapid wash-out in the portal venous phase (Fig. 2). The most common NET, the insulinoma, is usually small (< 2 cm in diameter). 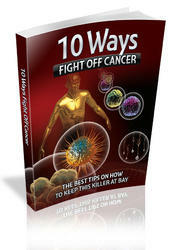 Metastases occur in only 5-10% of cases. All other NETs tend to be large and have metastases in 60-65% of cases. 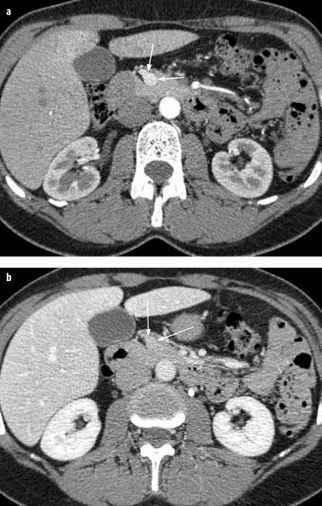 The appearance of liver metastases in patients with functioning NET is similar to that of the primary tumor. Fig. 2. a Thin-section MDCT of a neuroendocrine tumor of the pancreas (insulinoma), early arterial phase. A small hypervascular mass (arrows) is seen in the neck of the pancreas. b Thin-section MDCT of a neuroendocrine tumor of the pancreas (insulinoma), hepatic phase. In this phase the mass in the neck of the pancreas (arrows) is barely seen ultrasound provides excellent results in the head of the pancreas, but results are less convincing for the tail of the pancreas because of its distance from the stomach. EUS usually allows detection of even small NETs and their precise location. Ectopic gastrinomas may be missed by EUS, but combination with somatostatin receptor scintig-raphy increases the combined overall sensitivity to 93% for gastrinomas . The sensitivity of transabdominal ultrasound for detecting insulinomas ranges from 1960% with a mean of 46%, and therefore should not be used for this purpose. Functioning NETs of the pancreas are of low signal intensity on T1-weighted and of high signal intensity on T2-weighted images . Occasionally, an insulinoma can be of dark signal intensity on T2-weighted sequences due to a fibrous stroma. In our study, we reached a MRI sensitivity of 85% for detecting functioning NETs of 2 cm or less in diameter, which is similar to the sensitivity achieved by invasive procedures and is superior to most of the MRI results reported in the literature . Previous MR series reported a sensitivity of 100% , but the number of patients examined was small. For gastrinomas, some reports have shown MRI sensitivities of 25-62% [30, 31]. With present techniques, MRI should detect lesions greater than 2 cm, with a sensitivity of greater than 85%. Therefore, MRI appears to be a useful technique for diagnosing small pancreatic NETs, but optimal MRI techniques and state-of-the-art equipment need to be used. Overall, MRI results are presently surpassed by contrast-enhanced MDCT because of volume imaging and very thin sections. Somatostatin receptor scintigraphy using various derivatives of long-acting somatostatin analogues  can be used for small gastrinomas, somatostatinoma, glucagonoma, carcinoid and VIPoma, but insulinomas may be missed due to reduced receptor expression . Somatostatin receptor scintigraphy with mIn-octreotide can often diagnose small lesions only suspected on CT or MRI  and detect metastases not diagnosed with other modalities.